A recent question from a reader, inspired me to write this article on how to set up and switch between several email accounts in Outlook 2010. The How To article showing you how to set up an account has already been written and I will not repeat that part but rather link to it later on. Setting up a second (third, fourth … ) account in Outlook. Adding several accounts to your Outlook 2010 is a simple task. Using them and switching between them is also very easy. What you DO need to decide before adding several accounts is, which will function as your main account, and should the accounts use the same PST-file (the database storing your emails) or should you use separate PST-files ? Functionality will be the same, no matter what you choose. In the last section, I will give my thoughts on pros and cons using one or two PST-Files. Click the ACCOUNTS-button and then the Account-Link popping up underneath it. Follow the steps found here. In the top left corner you find the From, To, CC-buttons. Notice that the FROM-button now has a little arrow attached to it. If you have decided to use several PST-files, you may also choose which account to use by simply highlighting the appropriate InBox in the account/folder listing, before opening a new Email Document. Outlook will choose the account corresponding to the InBox selected. 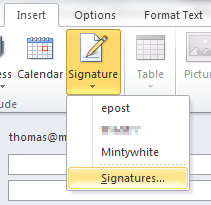 If you automatically want to add signatures to your new emails, you can set Outlook to use different Signatures for different accounts. Here’s how. Setting this up, may not be very intuitive to you (Another Note to the Outlook developers). But it is rather simple one you know how. In the right hand side of the Signatures Window there are three pull-down menus titled “Choose Default Signatures”. It would be fair to assume you choose these settings while creating your Signature, but that’s not it. They have no relations to the Signature creation what so ever. They really should have been put in a separate dialog window. But that’s another discussion. After creating all of your signatures they will appear in the pull-down menus. The settings are stored immediately and you do not need to close the Signature Window until you’re all done. Using One or Two PST-files ? The following reflects my experience. You may experience it differently, and if so please feel free to add your own comments on the matter. Choosing one PST-file may slow down performance when the one file get large. On the upside, you will only have one set of folders to worry about (one inbox, sent box, deleted items etc.). You will also not need a large monitor to see all inboxes at once in the folder/account listing. I struggled for hours before finding your tip. I am impressed that you managed to figure it out.